Balmy days, sultry nights, and islands that appear to float just above the breaking waves await. Take in gorgeous panoramic views that include deep blue seas, lush green valleys, striking volcanic peaks, and beautiful waterfalls as you sail away with the women of Olivia. This all-inclusive, 7-night itinerary is perfect for those who want to experience the best French Polynesia has to offer in just a week. See yourself swimming through Tahiti's crystal clear water, snorkeling under cauliflower coral reefs with brilliant sea life and fish schooling by the thousands. Perhaps you'll learn the secrets of Polynesian cooking or take an optional helicopter tour for a bird's-eye view of these incredible islands. You might even see dolphins jumping next to your ALL-INCLUSIVE, 6-star luxury ship, the ms Paul Gauguin, complete with a watersports marina, three restaurants, three bars and a Deep Nature Spa to relax your body and nurture your soul. Sound like a bucket list trip? We think it does. In the evenings, we'll keep you entertained with signature Olivia entertainment and shows by the Gauguines, local women who come on board to graciously share their culture through traditional Polynesian dance and performances. As always, we've chartered this entire six-star, all-inclusive ship so you can be out and free. Visit the stunning Society Islands and the Tuamotu Archipelago – a diver's paradise – in just one week! In the low-lying atolls of the Tuamotus – none of the which rise more than ten feet above sea level – you'll visit Fakarava, a UNESCO-Classified Nature Reserve, and Rangiroa, home to the second-largest lagoon in the world. You'll also explore the Society Islands renowned for their exquisite beauty: the "Garden Island," Huahine … legendary Bora Bora … Moorea, said to be the inspiration for Bali Hai … and our own private islet off the coast of Taha'a. One departure only, so don't miss this chance to see highlights of two French Polynesian island groups on a unique, 7-night itinerary! 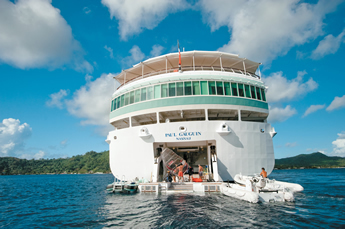 To understand the meaning of luxury, simply step onboard the award-winning, all-inclusive six-star ms Paul Gauguin. This remarkable ship features staterooms and suites with stunning ocean views, beautiful common areas, a state-of-the-art retractable watersports marina and world-class restaurants. You'll also find an extensive spa, a pool, a casino, a grand salon for performances, a piano bar and 360-degree observatory. And remember, all beverages—including coffee, wine, bottled water, cocktails and soda are included. 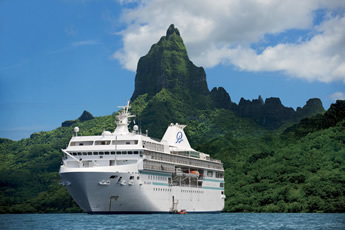 The ms Paul Gauguin was specifically designed for sailing French Polynesia year-round. The onboard atmosphere is an extension of the informal, relaxing environment of the islands and radiates warmth and informality. Its unique style of luxury has numerous awards for its accommodations, food and service from Condé Nast, Cruise Critic, Magellan, Travel & Leisure and Women's Choice awards every year from 2006-2017. 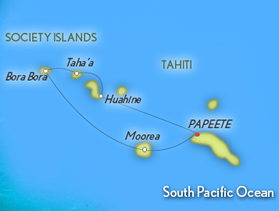 You will need to fly in and out of Papeete, Tahiti (PPT). We encourage all passengers to arrive early to avoid the stress of unexpected delays. We will be offering a pre-cruise stretcher package that will include Papeete and Moorea, and a day room option in Papeete for early arriving flights on August 24, and a post-cruise stretcher package in Bora Bora. Please arrive before 11 pm on August 24 and make you way to the ship. The ship departs at 11:59 pm. They are used to the 9:30–11 pm arrivals on the day of embarkation each week. However, if the flight is more than 2 hours late, we will have to sail and you would need to meet us in the next port. We always recommend arriving on the earlier flights, coming in a day early, or to take advantage of the pre-cruise stretcher packages we provide. a. It gives you an extra weekend day at home. Some people appreciate this extra day to unpack, do laundry, and relax before going back to work on Monday. b. It saves you the cost of a hotel day room prior to your flight departure on August 31. 2. Depart the evening of August 31. If you depart on August 31, you will want to have a dayroom at a hotel with a place to store your luggage. The only real option is to purchase a day room at a local hotel as you wait until the evening for your flight. Day rooms are expensive in Tahiti. The option of departing the night prior saves you the cost of a dayroom. Day room packages will be available to purchase prior to the trip, and will include a transfer from the ship to the hotel, a dayroom and use of hotel facilities, and transfer to the airport. Please note the airlines may change their flight schedules, and there may be a morning flight available on August 31, 2019 out of Papeete. Be sure and check with your airline for all options. Please arrive before 11 pm on August 24 and make you way to the ship. The ship departs at 11:59 pm. They are used to the 9:30–11 pm arrivals on the day of embarkation each week. Your departure out of Papeete on August 31 can be at anytime, as we arrive in Papeete the night prior (August 30) at approximately 7 pm. However, most of the flights to the U.S. depart in the late evening. Begin your voyage through paradise in the capital of Tahiti, the largest and most populated of the French Polynesian islands. 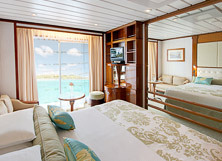 Here you'll embark the luxurious yet casual ms Paul Gauguin. With an endless choice of things to do, from relaxing poolside with a book to playing the slots in the casino, you will never be bored. 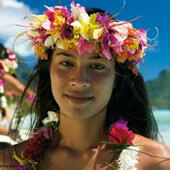 Today, you'll call on Huahine, known as the “Garden Island” for its lush rainforests and dramatic terrain. While here, you might explore the island’s sacred sites and legendary landmarks that are among the best-preserved archaeological remains in French Polynesia. 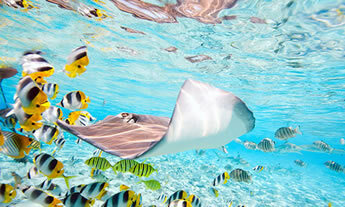 Enjoy snorkeling or scuba diving in the expansive lagoon or a picnic on the beach. Motu Mahana, an islet adjacent to Taha'a, is our very own South Seas paradise, featuring white-sand beaches with swaying palms, crystal-clear waters, and gentle breezes. As an exclusive Paul Gauguin Cruises event, you will spend a full day on this idyllic island, pursuing your own pleasures from swimming, snorkeling, and kayaking in the turquoise lagoon to playing volleyball, learn Tahitian cooking secrets, or simply relaxing on the beach. 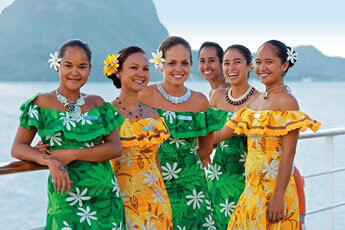 Enjoy a delicious barbecue lunch and Polynesian entertainment featuring strolling musicians and singers. Pulitzer Prize-winning author James Michener called Bora Bora “the most beautiful island in the world.” Dominated by towering Mount Otemanu and surrounded by a lagoon protected by low-lying coral reefs, this is indeed a spectacular destination. You’ll discover this quintessential Pacific paradise. Perhaps you’ll explore its exquisite lagoon on a snorkeling tour or underwater walk, enjoy a bird’s-eye view on a helicopter tour, or thrill to a sunset tour by jet boat. 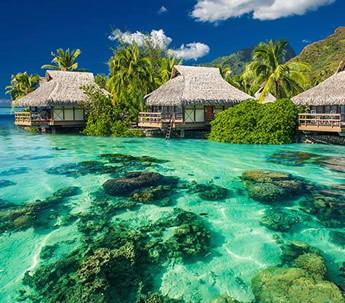 The dream destination of Bora Bora just begs to have its picture taken, with lush peaks, white sand beaches, and romantic lagoons. But perhaps Bora Bora’s most iconic image that of Mount Otemanu, with its jagged, emerald-hued peaks rising high above the shoreline. With only 4,225 inhabitants and a laid-back, island vibe, visitors to this beautiful corner of the world can’t help but just relax and take it all in. Graced with an abundance of fresh fruits and flowers, spectacular mountain peaks, peaceful multi-hued lagoons, and palm-fringed beaches, Moorea boasts an awesome beauty that is unsurpassed. During your visit, you might wish to shop for local crafts, embark on a dolphin-watching expedition with a marine biologist and witness these fascinating animals in their amazing natural habitat, or try out some of the local pineapples, said to be the most delicious in all of French Polynesia. Moorea, often likened to James Michener's mythical island of Bali Hai, is worth a visit just to experience its spectacular vistas. Volcanic peaks, reflected in the waters of Cook's Bay and Opunohu Bay, rise like a shark's jaw above palm tree-lined beaches. The underwater world is just as enchanting, with sharks, tuna, dolphins, and tropical fish—no wonder it’s a popular destination for divers. Cap off your epic journey where it all began. You won't be the same as when you first set sail—these exotic isles are said to touch people in magical ways. Late this afternoon, The Gauguin cruises to Papeete, docking for the night. Today you'll disembark the ship, but that doesn't mean you have to leave the islands! Join us for our post-cruise vacation stretcher in Bora Bora to see what the most beautiful island in the world has to offer. The official currency of Tahiti is the French Polynesian Franc (XFP). Most of the tourist venues will accept U.S. bills and Euros, as well as major credit cards, but may give change in Polynesian Francs. We recommend that you use the ATM to get a few Polynesian Francs while there, or exchange a few with a hotel if staying there a day or two prior. Taxis will accept U.S. dollars. If traveling from any other country than the U.S., we recommend that you convert your local denomination to US currency or Euro before you leave, as these are both widely accepted. You will need a passport that is valid for six months past the date of the trip. If you are not a U.S. citizen, please check with both your country’s consulate and the consulates of the countries we will be visiting to make sure that you do not need an entry visa or other additional documentation. If you are a U.S. citizen, you DO NOT need to get a visa ahead of time. If you are not a U.S. citizen, please check with both your country’s consulate and the consulates of the countries we will be visiting to make sure that you do not need an entry visa or other additional documentation. A taxi transfer to the ship from the airport will run approximately 1700 XFP ($30 USD) for the base fare, and an additional 203 XFP (approx. $2.25 USD) per piece of luggage. In the evenings, you may be charged an extra $10–$15 USD. 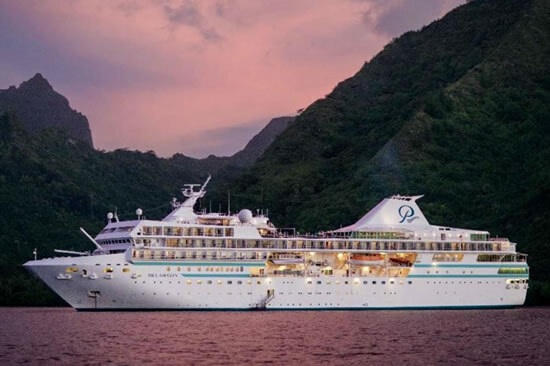 The Paul Gauguin will be docked at the port of Papeete, Tahiti. The port is located in downtown Papeete and is just 20 minutes away from the international airport of Papeete. Embarkation and check in will be available after 3 pm. However, if you have an early morning flight arrival, we will offer optional day-room packages at the host hotel. This will include breakfast, use of the facility and an afternoon transfer to the ship. All guests will disembark the ship by 9 am on August 31. Pre-cruise vacation stretcher packages will be available in Moorea and a post-cruise vacation stretcher package will be available in Bora Bora. Please check back to the Vacation Stretchers for more information, approximately 9–11 months from the trip dates. Deck 7. The Owner's Suites feature floor-to-ceiling windows with sliding glass doors that open to a very large private balcony, a bedroom area with queen-size bed and vanity, a marble appointed bathroom with full-size tub, separate shower, dressing area, and large closets, and a large separate sitting area with sofa, chairs, cocktail table, and writing desk. Suites are equipped with a refrigerator stocked with soft drinks and bar setup upon embarkation; remote-controlled television, DVD/CD player, multi-channel radio, personal safe, direct dial telephone, hair dryer, bathrobes, and slippers. Owner's Suites also include butler service. Deck 8. Grand Suites feature floor-to-ceiling windows with sliding glass doors that open to a very large private balcony, a bedroom area with queen-size bed and vanity, a marble appointed bathroom with full-size tub, separate shower, dressing area, and large closets, and a large separate sitting area with sofa, chairs, cocktail table, and writing desk. Suites are equipped with a refrigerator stocked with soft drinks and bar setup upon embarkation; remote-controlled television, DVD/CD player, multi-channel radio, personal safe, direct dial telephone, hair dryer, bathrobes, and slippers. Grand Suites also include Butler Service. Deck 7. Veranda Suites feature floor-to-ceiling windows with sliding glass doors that open to a private balcony, a bedroom area with queen-size bed and vanity, a marble appointed bathroom with full-size tub, separate shower, dressing area, and large closets, and a large separate sitting area with sofa, chairs, cocktail table, and writing desk. Suites are equipped with a refrigerator stocked with soft drinks and bar setup upon embarkation; remote-controlled television, DVD/CD player, multi-channel radio, personal safe, direct dial telephone, hair dryer, bathrobes, and slippers. Veranda Suites also include Butler Service. Deck 7, Deck 8. 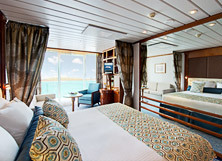 Veranda Staterooms feature floor-to-ceiling windows with sliding glass doors that open to a private balcony, a bedroom area with queen-size bed (some staterooms have convertible twin beds), and vanity, a marble appointed bathroom with full-size tub and shower, closet space, and a separate sitting area with sofa, chairs, and cocktail table. Veranda Staterooms are equipped with a refrigerator stocked with soft drinks and bar setup upon embarkation; remote-controlled television, DVD/CD player, multi-channel radio, personal safe, direct dial telephone, hair dryer, bathrobes, and slippers. 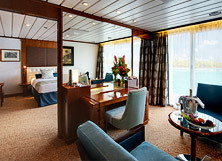 Veranda staterooms also include Butler Service. Deck 7. 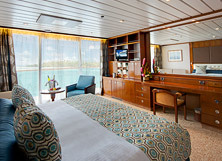 Balcony Staterooms feature floor-to-ceiling windows with sliding glass doors that open to a private balcony, a queen-size bed (some staterooms have convertible twin beds), and vanity, a marble appointed bathroom with full-size tub and shower, closet space, and a sitting area with sofa. Balcony Staterooms are equipped with a refrigerator stocked with soft drinks and bar setup upon embarkation; remote-controlled television, DVD/CD player, multi-channel radio, personal safe, direct dial telephone, hair dryer, bathrobes, and slippers. Deck 6. Balcony Staterooms feature floor-to-ceiling windows with sliding glass doors that open to a private balcony, a queen-size bed (some staterooms have convertible twin beds), and vanity, a marble appointed bathroom with full-size tub and shower, closet space, and a sitting area with sofa. Balcony Staterooms are equipped with a refrigerator stocked with soft drinks and bar setup upon embarkation; remote-controlled television, DVD/CD player, multi-channel radio, personal safe, direct dial telephone, hair dryer, bathrobes, and slippers. Deck 4. 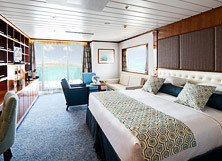 Window Staterooms feature a picture window, a queen-size bed (some staterooms have convertible twin beds), and vanity, a marble appointed bathroom with full-size tub and shower, closet space, and a sitting area with sofa. Window Staterooms are equipped with a refrigerator stocked with soft drinks and bar setup upon embarkation; remote-controlled television, DVD/CD player, multi-channel radio, personal safe, direct dial telephone, hair dryer, bathrobes, and slippers. Deck 3. 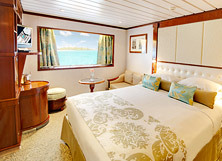 Porthole Staterooms feature two porthole windows, a queen-size bed (some staterooms have convertible twin beds), and vanity, a marble appointed bathroom with full-size tub and shower, closet space, and a sitting area with sofa. Porthole Staterooms are equipped with a refrigerator stocked with soft drinks and bar setup upon embarkation; remote-controlled television, DVD/CD player, multi-channel radio, personal safe, direct dial telephone, hair dryer, bathrobes, and slippers. Pre-cruise vacation stretcher packages will be available in Moorea and a post-cruise vacation stretcher package will be available in Bora Bora. Rates: Prices are per person and are based on double occupancy. Rates do not include airfare, entry and departure taxes, travel insurance, surcharge or NDA, which is $399 per person (subject to change). Early bird prices valid until February 25, 2019. Availability updated weekly and is provided for informational purposes only. The accuracy is not guaranteed. Olivia & Adonis Holiday will not be held responsible for any errors, omissions or inaccuracies. 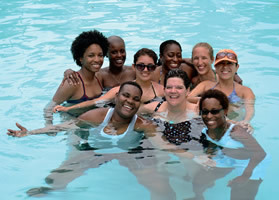 It is advised for guests to check information provided on this site with an Adonis Holiday Travel Consultant.